Like all Noongar terms there are variant spellings for the term moojar. These include mooja, moodja, moojarr, moodjar, mudjarr, mutyal, modjar, mutyal, mutdhoor and others depending on the recorder. Lyon (1833 in Green 1979: 171) records mutdhoor as “Nuytsia, floribunda – the cabbage tree.” It was colonially known as the cabbage tree by the early explorers and settlers. Moore (1841:58) records the name for the tree as mut-yal and the gum as modyar or mo-diar (1842:100, 55). Symmons (1841) records the name as mutyal and the gum mod-jar. The meaning of this descriptor term mooja or moojar is uncertain; however, we would suggest that it means the same as “mootcha” that is, prohibited or forbidden. The term “mootcha” (also spelt “mootchoo“) was used by Daisy Bates to describe marriages that took place between prohibited/forbidden kin ‘contrary to native law.’ Such wrongful marriages were traditionally punishable by death. Nuytsia floribunda – Photo by Ken Macintyre. Moojar – Nutytsia floribunda. Intense golden flowers after fire at Toodyay. Photo by Barb Dobson. ‘After taking slabs of wood from the trees to make shields, families returned later to collect and eat the raw, sweet gum that oozed from the wounded trees. They would also soak the flowers in water to make a sweet drink. (Daw, Walley and Keighery 1997: 28). The Swan River Aborigines say that an evil being, called Nyowalong, wanders about in the night-time, in the Banksia forests, collecting the gum of the Nuytsia floribunda, which he puts into bags hanging all round his body. They assert that he is like an old man walking about in half-sitting attitude, and carrying a wanna, or yam-stick, and that he utters a short, sharp screech at every step. I enquired why they never speared him; but they were indignant at the idea and replied – “One might as well try to spear a grass tree, he is so surrounded with gum bags”. Although they eat the gum which exudes from the acacias, hakeas, and other trees, they never touch the Nuytsia gum; for, were they to do so, they say Nyowalong would certainly do them some secret injury; but the fact is, it is not an edible gum – they make a virtue of necessity.” (Chauncy 1878: 267-268). 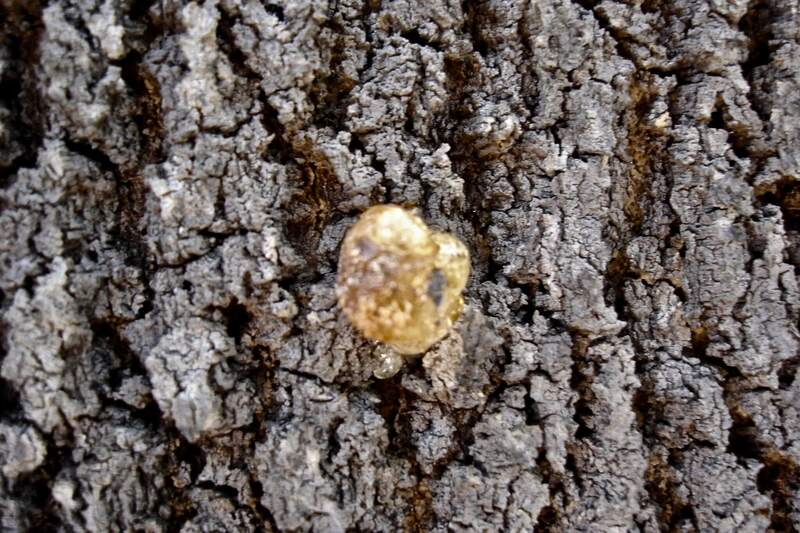 When we asked Elders during a bushland survey in the northern metropolitan area of Perth whether the gum was used as a food or material glue, they said they had never heard of the gum being used for any purpose. Most responded by saying that the gum was hard to find and no one they knew had tasted it. When we asked if they thought that the gum might be poisonous, they said they did not know. 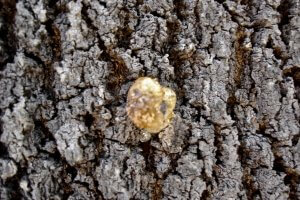 A number of years later one of us (Ken) tasted a sample of Nuytsia gum in the natural bushland at Beeliar (south of Perth). He sampled it with the utmost caution in case it contained potential toxins. 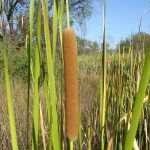 Ken reported that it did not taste sweet but was somewhat acrid and unpleasant. 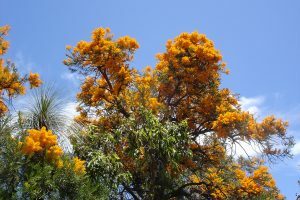 Nuytsia floribunda gum. Photo by Ken Macintyre. 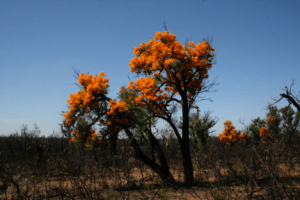 Moojar – the Western Australian Christmas tree (Nuytsia floribunda). Photo by Ken Macintyre. 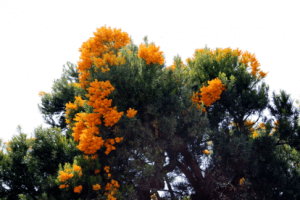 Moojar – WA Christmas tree (Nuytsia floribunda). Photo by Ken Macintyre. 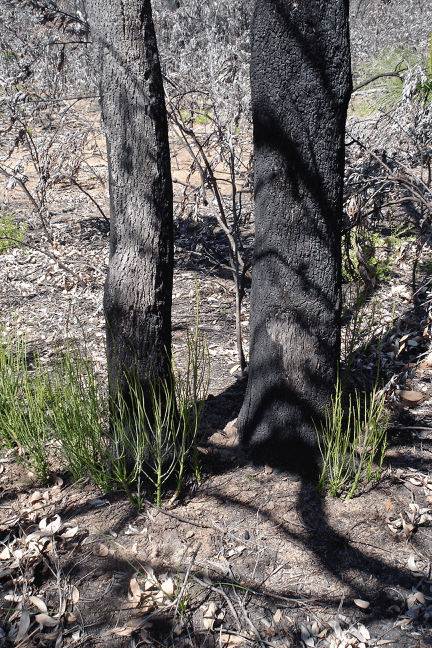 The new suckers of Nuytsia floribunda sprouting after fire. Photo by Barb Dobson. We find Hassell’s (1975: 26) account of her mungah root-tasting experience a little confusing. We would suggest that mungah is probably a variant spelling of mungart, mangart, mungyt, mungyte meaning ‘sweet’ or “sweetness” (e.g. 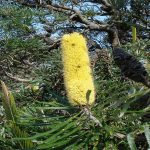 Banksia nectar), see our Banksia paper https://anthropologyfromtheshed.com/project/the-consumption-of-banksia-nectar-in-traditional-noongar-society/ According to Hammond (1933: 82) the term mungyt refers to ‘sugar, honey or anything sweet.’ One of us (Ken) has tried tasting the roots of the young suckers of Nuytsia during the hot dry season but they were not sweet. He described them as an “unpalatable chew.” We are not convinced that Hassell’s sweet tasting roots are those of the Western Australian Christmas tree. It is interesting that Hassell does not identify mungah to an identifiable tree species. Nor does Davidson, the American anthropologist who published parts of Hassell’s manuscript in 1935 and 1936 in which these “mungah” roots are referred to. Based on our research it was not until 1974 that Hassell’s “mungah” was attributed to Nuytsia floribunda by Sara Meagher (1974: 59) in her work ‘The food resources of the Aborigines of the south-west of Western Australia’ published by the Western Australian Museum for whom she worked at the time. A year later Meagher (1975: 26) edited Hassell’s book My Dusky Friends and inserted an editorial note beside the term mungah saying ‘thought to be Nuytsia floribunda.’ This attribution to species has never been scientifically tested or confirmed not even by the Western Australian Museum who published her work. It is very easy to make assumptions from vague historical descriptions, including those based on reminiscences written many years after the event, but jumping to conclusions and making assumptions and assigning a Linnaean species name to an unidentified Noongar food can be dangerous. In our view contemporary researchers too blindly accept the writings of earlier recorders as if they were “ethnographic fact” without conducting any rigorous scientific or even academic analysis of the ethnohistorical sources, context and cultural accuracy. Early ethnohistorical observations were conducted in a context where difficulties with language on both sides often led to cultural misinterpretations and many of these observations have never been questioned or critiqued from a cultural accuracy point of view. Independent scientific investigations and tests are needed to ensure that foods such as the mungah roots being attributed to Nuytsia floribunda is ethnographically accurate, if only for public safety. The strong scented flowers of Nuytsia floribunda attract large numbers of insects and insectivorous birds during the peak flowering season in November/ December. Photo by Barb Dobson. 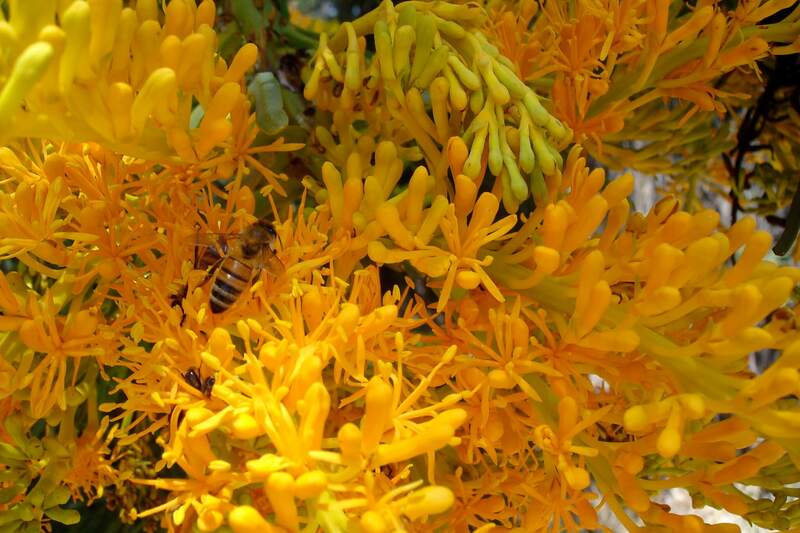 Bees attracted to the strong scented flowers of Nuytsia floribunda in November. Photo by Barb Dobson. 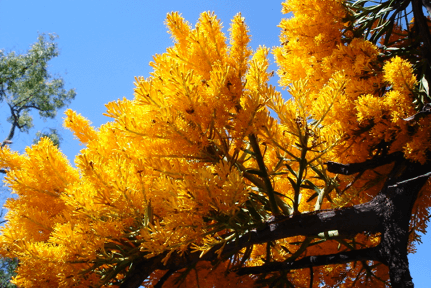 Collecting the flowers of Nuytsia and making it into a sweet beverage? We asked the Elders whether they had used or heard about the flowers of the mooja tree being used for the purpose of collecting nectar. Some said they had heard stories that the flowers may have been used for nectar but they were unsure who had told them about this. 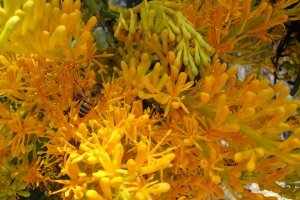 We were aware of many anecdotal sources on the internet which referred to the flowers of Nuytsia being made into a sweet drink and even into a heady alcohol but as far as we could ascertain this information came from a Western Australian government publication by the Conservation and Lands Department (CALM) authored by Daw, Walley and Keighery (1997: 28) which describes how Noongar people used to ‘soak the flowers in water to make a sweet drink.’ But, apart from this reference, we could find no supporting evidence or reference to this practice in the ethnohistorical or ethnobotanical literature. 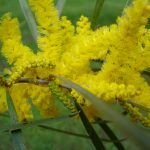 Meagher (1974: 45) and Bindon (1996:186) do not make any mention of indigenous people soaking the nectareous flowers of Nuytsia and making it into a drink. There are many ethnohistorical references to the soaking of the nectareous flowers of the Banksia and the flowers of the marri, jarrah and Grevillea but not the Nuytsia. Chauncey in Brough-Smyth (1878) refers to shields being made from Nuytsia floribunda by the tribes living to the north of Perth. 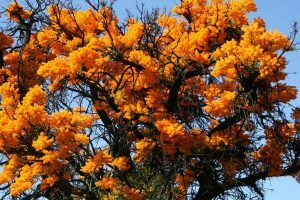 In this article we have tried to highlight the opposing views in the literature regarding the edibility of the gum of Nuytsia floribunda. 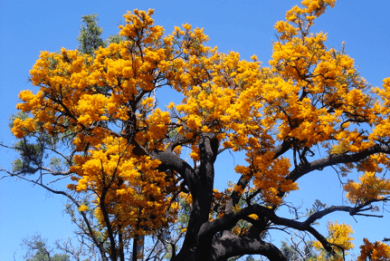 The Assistant surveyor for the Perth region, Mr Philip Chauncy (1886) noted in the 1840’s that the Swan River Aborigines never ate the Nuytsia gum. 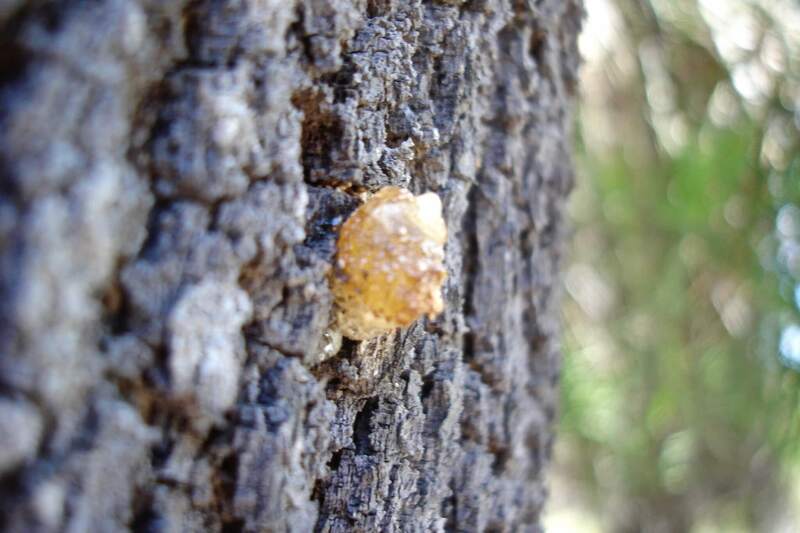 Bindon (1996:186) in his book Useful Bush Plants published by the Western Australian Museum also suggests that the gum of Nuytsia floribunda was not eaten by people. This paper is based on archival research and field interviews between 1992 and 2005 with Noongar spokespersons from the Perth, Pinjarra and Moora areas. We would like to thank all Noongar people who have over the years participated in heritage surveys and shared their knowledge of indigenous bush foods and their preparation. Joobaitch was one of Daisy Bates’ informants from the Guildford area who died in 1907. He was ‘a storehouse of the laws, traditions and folklore of his people’ and he never picked the flowers or branches or sat beneath the shade of the “spirit tree” (Nuytsia floribunda). (Bates in Bridge 1992). Daw, B., Walley, T. and Keighery, G. (1997). 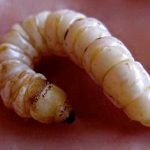 Bush Tucker Plants of the South West. 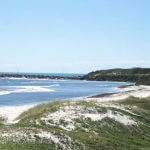 Department of Conservation and Land Management, Western Australia. Hammond, J.E., 1933 Winjan’s People. Perth: Imperial Printing Co.
Meagher, S.J., 1974 The food resources of the Aborigines of the south-west of Western Australia. Records of the West Australian Museum 3(1): 14–65. Moore, G.F. 1841 ‘Aborigines of Australia – Swan River: Domestic Manners.’ The Colonial Magazine and Commercial Maritime Journal. May to August 1841. Vol. V. London: Fisher Son & Co. Edited by Robert Montgomery Martin Esq. pp. 309-315.